The function of immunoglobulins is to bind to antigens, where an antigen is a molecule, typically part of a protein, that is usually foreign to the body. 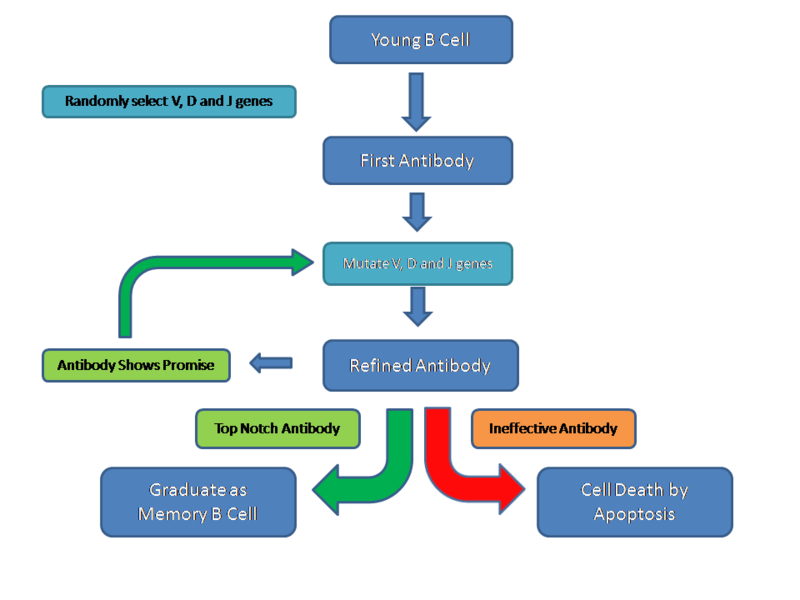 Binding of an antibody to an antigen has several roles. Each antibody is specific and highly selective for a particular antigen and will not react with other peptide sequences. Each B cell produces only one type of immunoglobulin. Immunoglobulins are conceptualised as Y-shaped molecules. 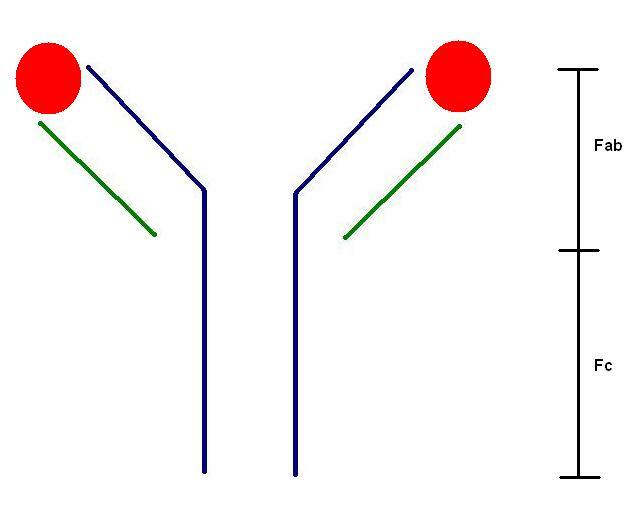 The end of each arm of the Y hosts the antigen-binding site; these two sites are identical. Thus, the basic immunoglobulin molecule can bind to two copies of its target antigen. The heavy chain of the immunoglobulin molecule is shown in blue; the light chain is green. Two bound antigens are depicted in red. The Fab segment is the antigen binding component while the Fc is the constant region of the molecule. Each basic immunoglobulin molecule is composed of two copies of the same heavy chain and two copies of the same light chain. The light chain is involved only in the antigen binding region of the immunoglobulin molecule. Two subtypes of light chain exist, kappa and lambda. Each immunoglobulin contains only one subtype of light chain because each plasma cell uses only one of the two subtypes. Under normal conditions, plasma cells are more likely to employ kappa than lambda light chains by a ratio of two to one. In other words, around 67% of all of the immune system's different antibodies will contain kappa light chains and 33% will have lambda. The heavy chain also contributes to the antigen binding site of the antibody, but its constant portion (the Fc part) has other functions such as binding and activating complement and interacting with phagocytic cells. There are five subtypes of heavy chains (delta, gamma, mu, alpha and eta) and these determine the five subtypes of immunoglobulin, IgD, IgG, IgM, IgA and IgE. IgD is the overlooked subtype. Beyond its function in forming the B cell receptor, it is not known to have any other role. IgG is the most common subtype of immunoglobulin and itself has four subclasses. It is found in the blood and the tissues. IgG can cross the placenta and therefore confers passive immunity on the fetus. IgM is the largest immunoglobulin due the fact that its typical form is a pentamer which is composed of five identical cross-linked subunits. This composite molecule possesses ten antigen binding sites and is therefore adept at agglutinating antigens. However, its large size prevents it from crossing the placenta. IgM monomers may also form part of the B cell receptor. IgA has a specialist role in providing antibody cover for mucosal sites, such as the gastrointestinal tract. It is a dimeric molecule in which the two components are linked by the J-chain. Two subclasses exist. Approximately 1 in 700 people have a selective deficiency of IgA and this problem may rarely be induced by phenytoin. IgE is also a specialist immunoglobulin. Its function seems to be related to parasites because its main task is to activate mast cells and eosinophils. Of the four subtypes of immunoglobulin that are secreted (IgG, IgM, IgA and IgE), IgE has the lowest circulating levels in the blood. IgM tends to form first in the immune response to an infection. Levels of IgG increase later. However, while IgM levels subside once the infection has been erradicated, some IgG specific for that infection remains in the blood. Thus, a patient who has circulating IgG antibodies directed against a particular infectious agent, but not IgM antibodies, will typically have been exposed to that organism in the past but has recovered from the acute infection. By contrast, high levels of IgM, especially if they can be demonstrated to be increasing over a short period of time, imply acute infection. As well as using only one light chain and synthesising antibody that is specific for only one target antigen, B cells also only use one of the five subtypes of heavy chain. In humans, the earliest B cell precursors are located in the bone marrow. Ironically, it is said that the B of the name B cell relates to the bursa of Fabricius, which is the site of B cell production in birds, rather than the B of bone marrow. Very young B cells leave the bone marrow and circulate via the blood stream to lymph nodes and mucosal associated lymphoid tissue, where they take up residence in germinal centres. The maturation of B cells and their transformation from raw, naive recruits into honed, effective soldiers occurs in this barracks of the germinal centre. The variable portion of immunoglobulins is the antigen-binding site and features a hypervariable region. The hypervariable region is coded by three collections of genes, V, D and J, of which the genome contains 50, 20 and 6 variants respectively. Merely by randomly combining one choice from each of these three regions, 6000 different antigen binding sites can be generated. While this is a reasonable array, it is inadequate to confront the numerous types and subtypes of infectious organisms that exist. Therefore, in order to generate sufficient diversity in the antigen binding site of immunoglobulin molecules, B cells are actively encouraged to do something that is normally undesirable: they are equipped and permitted to mutate the DNA of their V, D and J regions to try to produce an immunoglobulin with the best specificity possible for its target. The B cell expresses its first attempt at an immunoglobulin on its surface membrane, either as the IgD or IgM subtype, where it constitutes the B cell receptor. If that B cell becomes exposed to the antigen that is recognised by the immunoglobulin of the B cell receptor, this event is transduced into a signal to the nucleus of the B cell and stimulates the B cell to engage in mutation of its hypervariable sequence genes to try to refine its antibody. B cells that produce ineffective antibodies are induced to kill themselves by apoptosis. Ultimately, the process of exposure to antigens and cycles of mutation of the immunoglobulin hypervariable genes results in a fully trained B cell that is equipped to fight effectively against a particular foe. These B cells graduate from the germinal centre, enter the mantle zone, acquire protection against apoptosis and can then circulate as memory B cells that await an encounter with their target (cognate) antigen. If a memory B cell meets its target antigen, it will transform into a plasma cell. Plasma cells synthesise large quantities of immunoglobulin. If a B cell response to an infection is initiated, the end result should be the extermination of that infection. This will remove the antigen from the body and therefore terminate the stimulation of the B cells and plasma cells, allowing the B cell antibody response to be self-limiting. When B cells secrete antigen, their default option is IgM. In order to change to IgG, IgA or IgE they must undergo the process of class switching. This process requires the guidance of T cells.